A dash of inspiration over my morning coffee. With this post the sample for day 100 is the last in the series. I feel that some sort of finish line has been met and deserves a detail that is a little different. It feels like an end of an era! This is a small sampler I worked on hand dyed 36 count linen fabric. 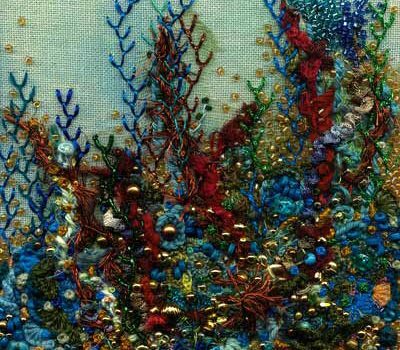 It is 6 inches wide and heavily encrusted with beads, metallic, linen, cotton, wool and silk threads of various weights are used throughout the piece. 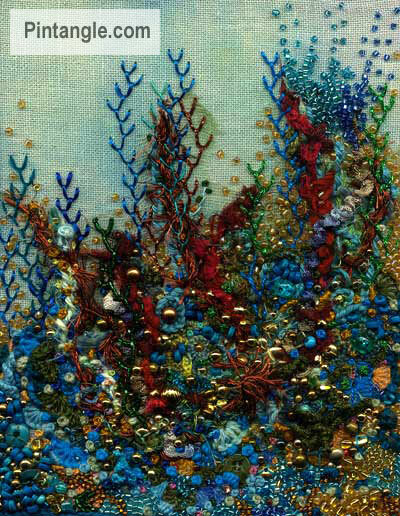 Textured stitches include caston stitch, Drizzle stitch, buttonhole wheel cups, buttonhole wheels, Oyster stitches, French knots and Bullion knots. All these stitches were packed very tightly to create an interesting texture. I hope you have found the 100 details in 100 days series interesting and you like day 100! It has been most enjoyable for me watching what people have done, seeing how ideas grow and most of all seeing new hands become hooked on stitching for pleasure. 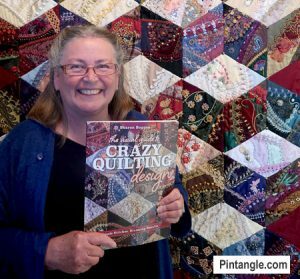 If you are just swinging by, or a search engine has landed you here, this is day 100 in a series of articles that aim to give you embellishment ideas that you can use in your crazy quilting. If you want to print out this series 100 details for 100 days they are listed under that category. Have you enjoyed this series? If so you may be interested in a tutorial I have written on how to work decorative crazy quilt seams. The tutorial is a comprehensive tutorial that I converted to a pdf file (a link to the download is in the article) When I converted it I realised how comprehensive it was. At 19 pages of information it is a resource worth investigating! No sign up or anything required its a free resource without strings. Your work has been a great inspiration for me. And its because of regular visits to your blog that I muster enough courage to write my own. I am in the process of learning from your stitch library and following your challenges.I am keen on working the 100details in 100days but I think at Stitchinfingers they have already closed the group. I commented but didnt get a response. Now I have decided to go on my own starting 01 Feb 2009 and doing a Mon-Wed-Fri post on this as everyday posting might not be possible for me. Do you think thats ok or do I have to join a group for this purpose?